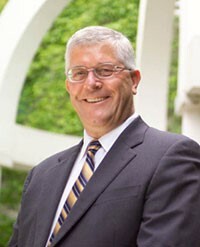 Dr. Max Blouw is former President and Vice-Chancellor of Wilfrid Laurier University. Previously, he was Vice-President Research and Professor of biology at the University of Northern British Columbia (UNBC). Dr. Blouw holds Bachelor and Master of Science degrees in zoology from the University of Manitoba, and a PhD in biology from the University of New Brunswick. He began his career as a biologist in the Department of Fisheries and Oceans in Winnipeg, and went on to teach biology at St. Francis Xavier University before joining UNBC in 1995 as a professor of biology. Dr. Blouw recently completed successive terms as vice-chair, chair, and past-chair of the Council of Ontario Universities (COU). He has served as a member of the COU’s Executive Committee, Holding Association Inc. and various other committees. He has a long-standing involvement with the Natural Sciences and Engineering Research Council of Canada (NSERC) and has served as an executive council member and chair of its award selection committees and committee on grants and scholarships. Dr. Blouw served two terms as the chair of the university advisory group to Industry Canada and was a member of the adjudication panel for the Ontario Premier’s Discovery Awards, which recognize the province’s finest senior researchers. He recently chaired the International Review Committee of the NSERC Discovery Grants Program. In 2005, Dr. Blouw received the Science and Technology Champion Award from the BC Innovation Council in recognition of his leadership. In 2009, UNBC renamed the Quesnel River Research Centre, The Dr. Max Blouw Quesnel River Research Centre at Likely, in his honour.